See Mr Issa-Onilu's full statement below. INEC's Supplementary Elections, Illegal Decisions on Rivers, Bauchi States: Our Stand! 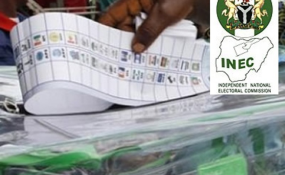 After the March 9 governorship elections across the country, the polls in six states - Adamawa, Bauchi, Benue, Kano, Plateau and Sokoto - were declared inconclusive by the Independent National Electoral Commission (INEC). The electoral process was also suspended in Rivers state in a very fraudulent circumstance. Even though the PDP claims a bogus lead of over 81,000 votes, reports strongly establish that this dodgy figure is an aggregate of 'votes' obtained by subterfuge not from the numbers recorded by the card reader. We are dismayed that some sponsored stakeholders including those who witnessed the killing of over 40 persons on the 2015 governorship election day alone due to someone's quest to become governor by all means, appear to be hoodwinked by the very same character to believe that security agents especially the Army should have stayed away to allow a repetition of what happened in 2015. It is now clear to all that INEC has become deaf and blind to the fact that Governor Nyesom Wike invaded the Obio/Akpor Collation Centre with over 200 armed thugs and ordered his security men to shoot an Army Captain and another soldier providing perimeter security to the Collation Centre. Wike's thugs carted away the electoral materials including both original copies of unit result sheets and ward collation sheets that were being used for the collation of results and took them to the Rivers State Government House where they were filled out with rigged and inflated figures. It is on record how the Kano State Police Commissioner actively assisted the opposition PDP to rig inside Kano city with the deployment of police security for Rabiu Kwankwaso loyalists while state commissioner's orderlies were withdrawn. Kano remains an APC state. With the massive votes garnered by our presidential candidate, Muhammadu Buhari; the entire incoming 9th National Assembly positions - 3 Senators and 24 House of Representatives - won by the APC in Kano State; 27 State House of Assembly seats won by the APC out of 39 and governorship election victories in all local governments outside Kano metropolitan, there is no doubt that Kano State is a stronghold and key support base of the APC. The APC's visible achievements in Kano state under Governor Abdullahi Ganduje are enough to give the party an emphatic victory in the rerun election. Again, the rerun will be mostly in APC-controlled rural areas and Nasarawa local government area where our Deputy Governor, Nasiru Yusuf Gawuna is from. Undoubtedly, Kano state remains an APC stronghold and remains in our firm control. We reject INEC's decision on the governorship election results from Tafawa Balewa local government area in Bauchi State, as signed and announced by the electoral body's National Commissioner and chairman of its Information and Voter Education Committee, Festus Okoye. We reiterate that according to Nigeria's 1999 Constitution (as amended) and INEC Guidelines for 2019 General Elections, the electoral body is not empowered to reverse any decision taken at the Collation Centre by the Returning Officer appointed for that purpose. In Adamawa, the party had reported over-voting and use of security personnel to intimidate APC agents and supporters. While we are confident of our party and candidate Governor Jibrilla Bindow's victory ahead of the supplementary election in the state, we urge all stakeholders to avoid actions that can plunge the state into crisis.